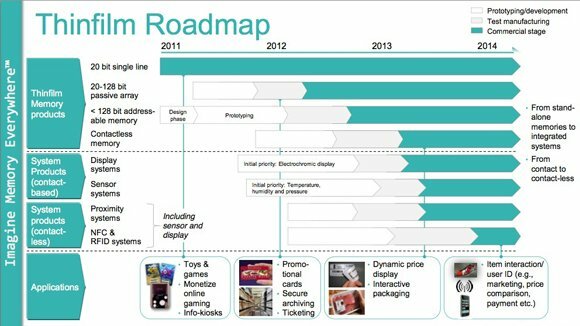 Updated Thinfilm, a Norwegian developer of printable memory, has co-announced with California's PARC a development that takes a big step towards the day when every manufactured object will report in to the internet. Yes, the "internet of things" – the buzzword of the decade. 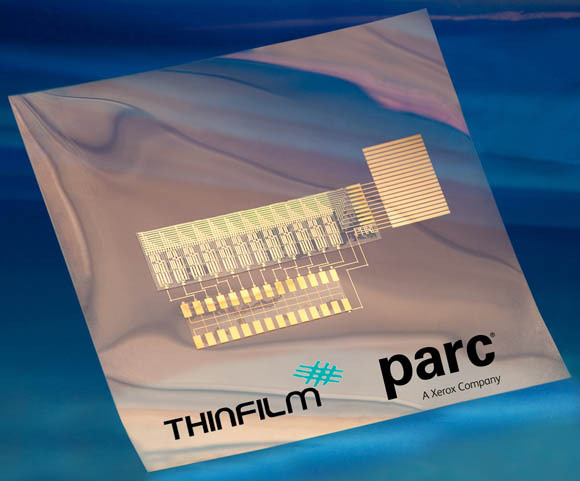 Thinfilm and PARC's breakthrough is a technology that can print not only memory onto, well, thin films, but can now also print transistors to address and manage that memory. 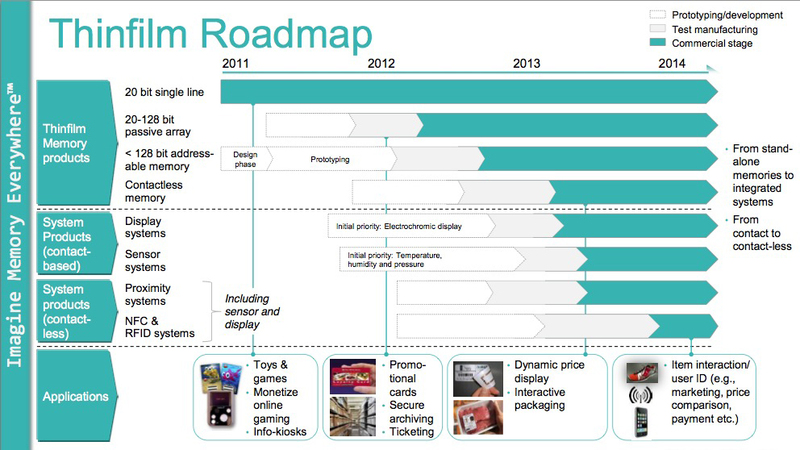 Since 2006, Thinfilm has been producing low-capacity read/write printable memory, which has been used in such applications as personalized toys and games. How low is "low-capacity"? Twenty bits – but although that may sound meager, know that Thinfilm's current products aren't intended to store an HD video of Laurence of Arabia, but instead, to hold identification and personalization information. And to do so cheaply. Very cheaply. A few cents per unit cheaply. Up until Friday's announcement, Thinfilm's non-volatile, ferroelectric memory was completely passive – it just sat there, holding those 20 bits in its memory cells. To be rewritten or read, it needed to be accessed by an external device which used one access pad for each memory cell. What Thinfilm and PARC have now developed is the ability to print not only the memory cells, but to also print the logic onto the same substrate needed to manage those memory cells. "This is the first time that you're combining organic, semiconductor-based transistors in an equivalent style to CMOS in silicon," Thinfilm CEO Davor Sutija told The Reg. "It's not metal-oxide, so you can't really call it CMOS," he said. "It has n-type and p-type semiconductors in the design, and we're using that logic to address and decode the printed memory." These transistor-and-memory building blocks will allow for standard roll-to-roll printing techniques to be used to build integrated printed systems. "Now, for the first time," Sutija said, "we can add logic to control the memory, to read the memory, to address the memory." At this point in the transistor-printing development, the logic cannot yet write to the memory – that's a future goal, Sutija said. But even with read-only access, the ability to have the printed logic on the same substrate as the memory cells allows for multiple groups of those cells to be accessed by the same number of access pads – the logic takes care of sorting out which bits come from which cells. The next step after achieving read/write systems, Sutija said, will be adding components to the printed materials that can read sensors and store information from them into the memory. Once that milestone is reached, these dirt-cheap nature of these printed devices will enable them to be attached to almost anything, and with appropriate contact and non-contact interfaces, report back on everything – the "internet of things". "Of course," Sutija said, "the Holy Grail is NFC and RFID systems." Thinfilm and PARC aren't working in a vacuum. "There are a number of companies," Sutija told us, "that have been working on printed sensors, printed power sources, printed displays, and we're going to be active in build an ecosystem with these other partners to be able to then create integrated products." Such an ecosystem could, for example, be able to tell you which individual items in a shipment of, say, frozen fish sticks, had warmed unsafely during transport. It could also create printed price tags that could change the amount to charge you for those fish sticks, if you happen to have a digital coupon in your smartphone. And each of those tags could be printed, accessed over the air, and be quite inexpensive – although, in an "internet of things" with billions of components, manufacturing all of those inexpensive items could add up to a pretty penny. When The Reg spoke with Sutija this Monday, the Thinfilm-PARC team had yet to establish the ability to write to their transistor-and-memory system. This Friday, however, they told us that during the week they achieved that capability, and will be demonstrating both reading and writing at their Addressable Memory roll-out event on Monday, October 24, at PARC. Printable circuitry is quite the fast-moving field, it seems.